Ladies, we hope you’re hungry! We have teamed up with the fabulous Australian pasta brand Vetta to offer you their delicious pasta for FREE! Yum! Vetta pasta is made using authentic Italian pasta making techniques and Australia’s finest quality Durum wheat. To maintain the high quality and standard of our Vetta products, we only use 100% top grade Australian wheat and semolina, sourced from Northern New South Wales. Vetta products are proudly labelled Low-GI and an excellent source of complex carbohydrate, low in fat and sodium. 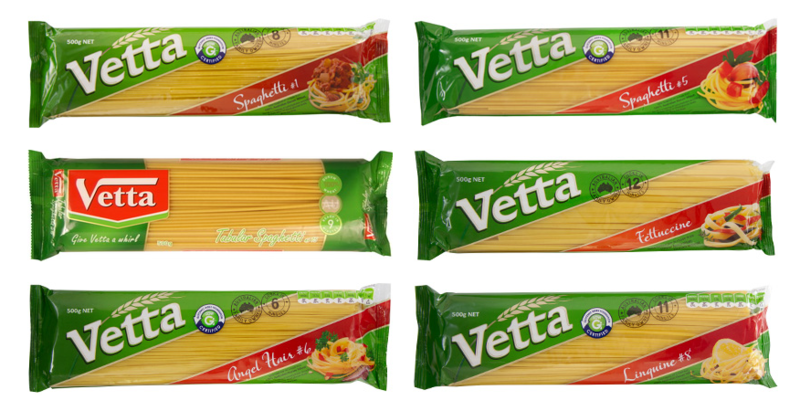 Vetta also offer a range of first-class high-fibre products, with twice the fibre of standard pasta, while maintaining that same great taste. Producing a premium, healthy and affordable range for people everywhere, Vetta pasta is known for delivering products that hold their shape when cooked, resulting in an ideal al dente texture for all pasta enthusiasts. Receive your Vetta Spaghetti free when you order your dresses with us! Posted January 16th, 2015 in Partner, Partner Offer. Tagged: Australia, Australian, Dresses, Fashion, food, Girl Meets Dress, GMD, hire, rental, Spaghetti, style, Vetta, Vetta Pasta.